SECOND New Zealand Expeditionary Force 2NZEF cap badges used between 1939 - 1945 as the "generic" Overseas Service cap badge. 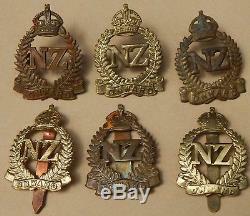 Regular New Zealand-worn unit badges were REMOVED for "intelligence reasons". The top three "Onward" badges are all by different manufacturers and were produced with "lugs" (rather than "Slider" attachments). The bottom three were produced OUTSIDE New Zealand (Most NZ made badges use "lugs" rather than the "slider"). The two slider mount badges on the LEFT are UK-Manufactured badges. The SAND CAST slider badge on r/h side was made in Egypt when badge supplies from either the home country or "mother country" (UK) were not readily available. Add a map to your own listings. The item "New Zealand WW2 Overseas CAP BADGE Collection of 6 SIX Variants GENUINE 2nd NZEF" is in sale since Tuesday, January 1, 2019. 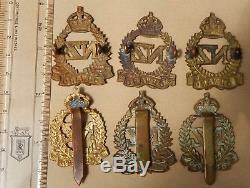 This item is in the category "Collectibles\Militaria\WW I (1914-18)\Original Period Items\Great Britain\Badges". The seller is "phillip_in_new_zealand" and is located in Auckland (aprox. 12,000 "clicks" from USA). This item can be shipped worldwide.